And then there are those days when chocolate is all you need | This is the breakfast for those days. When I was in NYC, there were SO many delicious bakeries and restaurants at my constant disposal. It was wonderful. As a result, I didn’t do any cooking or baking the entire 3 weeks. Pretty impressive right? (Not really, I missed my kitchen!) But, it was fun to run to a different market, store, or bakery for every meal. 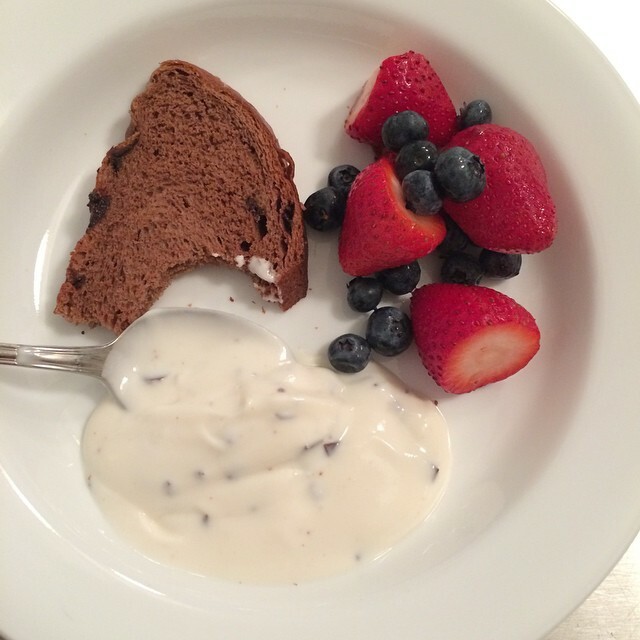 This breakfast was a staple of mine for the first week | And it was a complete accident! The Bread: A bakery on the street where I stayed had fresh baked bread, so of course, I decided to buy a loaf. I asked for walnut raisin (my favorite) and instead I got chocolate bread with chocolate chips! Imagine my surprise when I took it out of the bag at home. The Yogurt: Do you see those little black chips in my yogurt? Yes… those are chocolate chunks. Apparently I bought chocolate chip yogurt. (It looks extremely similar to the vanilla flavor – just sayin’) It’s greek though, so yay for protein! P.S. It’s Chobani Greek Yogurt | So good. With all that chocolate, I knew I had to throw in something healthy! So mixed berries were the perfect addition. Let me tell you, this breakfast is delicious! For a little healthy tweak, I would switch the chocolate yogurt out for plain greek yogurt with a little drizzle of agave for sweetness.